Christmas is fast approaching its only 39 days before Christmas. Yesterday Vince, hubby saw the different style of parol in the street. Then I bought parol for my Christmas decoration. The parol is made from wire, plastic and capiz with shining Christmas light that gives the happiness for every Filipino during the Christmas season. Anyhow, paróls is tradionally have a star-shaped framework made of bamboo sticks which are then covered by coloured pieces of either Japanese paper or crepe paper. The most common form is a five-pointed star with two decorative “tails”. Paról is an ornamental, star-shaped Christmas lantern from the Philippines. It is traditionally made out of bamboo and paper and comes in various sizes and shapes, but generally the basic star pattern remains dominant. It’s also retains its original association with the Simbang Gabi ritual, a series of dawn masses that lasts for nine days. These lanterns remain until January, traditionally removed after Ephipany to honour the Three Kings and their visit to the infant Jesus. I choose belen design because it’s a Filipino term derived from the Spanish word for Bethlehem. Two or three-dimensional figures are usually found in a Christian nativity scene. 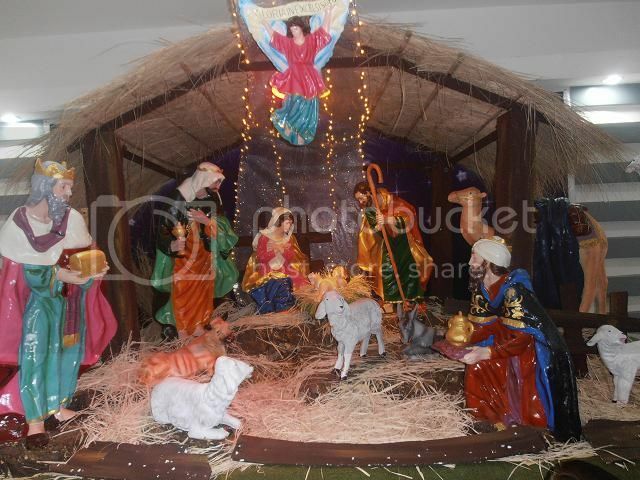 Inside a barn or stable shows the child Jesus lying in a manger while Mary and Joseph watch over him. Oftentimes, the scene includes the Three Wise Men or Magi (with or without their camels), the angels, the shepherds and their flock, a donkey, an ox, and the Star of Bethlehem that led the magi to Jesus’ birthplace. Today, the Christmas tree is enjoyed as a holiday decoration by people of many cultures and religions. Just because the Christmas day is approaching people are making Christmas tree. Christmas tree is a central point of home decoration. They have a different design and color you will see in mall but the price is expensive. So if you are creative or artistic you can make a beautiful Christmas tree at your own idea. Anyway, last week I put Christmas tree at home. The Christmas tree is three years old already. I thought I will change the color combination because the last two years my Christmas tree is a combination of yellow and red. So I bought yellow color decorations this year for a change. 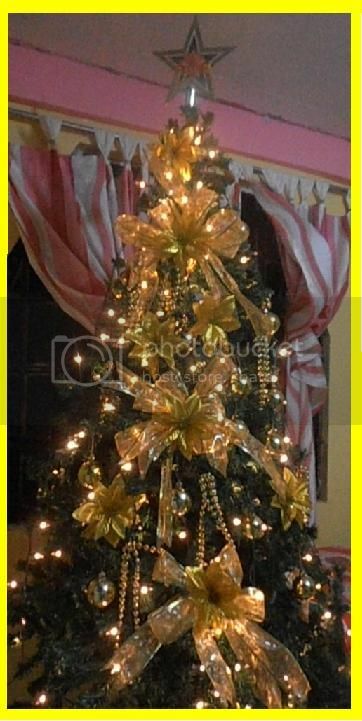 And add yellow Christmas lights and ornaments to make it more beautiful and attractive. Today have many decorating idea you make it in your own home, I found an artificial flower home décor in the mall today. It’s pretty, simply and very affordable it cost around $3 dollar. For me it would be nice to put on a table or you can put any part of your home. I will attract the color combination of two flowers, red and white with their blue vase. Christmas is coming; my hubby, Vince and I went to SM City Lucena to see the nice Christmas decoration of SM Lucena, every year they have a beautiful decoration. Today they have a giant Christmas tree where SM shoppers can take souvenir photos. I haven’t attended SM Lucena launching, but I feel the spirit of Christmas and make everyone shopping experience at SM more enjoyable. The Christmas season has officially started at SM Supermalls. The Christmas is coming, when Jesus is born and it’s my favorite holiday of the year. I have a Christmas tree, i bought it last year. I prepare to decorate my Christmas tree; it is a perfect symbol of a Christmas season. First i will prepare the basic information of the tree such as garlands, ornaments and lights. I put the different design and color of the ornaments to the garlands from top to bottom. After that i will arrange the Christmas lights near the base of the tree. Then i put the star on the top of the tree. Here’s my new Christmas tree, my nephew Vince helps me to put the ornaments on a tree.